Questroyal Fine Art, LLC, is an established American art gallery specializing in quality American paintings from the nineteenth and twentieth centuries. 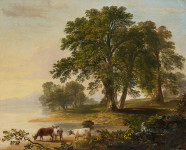 Questroyal’s extensive inventory of over four hundred artworks includes important Hudson River School, tonalist, impressionist, and modernist examples. Charles Burchfield (1893–1967), "Sunflowers at Late Dusk, 1916"
"Pastoral Scene at Lake's Edge"
"A Trail through the Trees"
Antiques and The Arts Weekly is the nation’s leading weekly publication on the antiques and the arts trade, and is available both in print and online. Each issue average between 100-200 pages and includes reporting on auctions, antiques shows and the arts while providing a platform for both buying and selling. We have been providing breaking news and important information on the world of antiques and the arts since Publisher R. Scudder Smith started Antiques and The Arts Weekly back in 1963.